The canopy was made with dotty paper from the Subtles designer series paper stack. You can get every single Stampin' Up colour in these paper stacks and I can't tell you how useful it is to have tone-on-tone designs that match the colours in your projects! I trimmed the edge with the Scallop Edge border punch for a decorative finish and popped it up on my card base using dimensionals so I could suspend my baby socks from them. How cute are these sockies?! It was lucky my teenage children weren't around while I was making this card because I felt the urge to pinch someone's cheeks! I made a hole in each sock with my handheld 1/16" punch and threaded bakers twine through, fastening it to the back of the canopy with tape. The bow is added to the front of the canopy separately. The socks aren't heavy enough to dangle so I pulled the twine taut and fixed the socks into position with dimensionals. That's the Ticket is another great Stampin' Up set and this gorgeous sentiment is a favourite of mine for baby cards - because they are all 100% perfect and precious to us mums aren't they?! You can cut these tickets out with the coordinating Ticket punch and I stapled mine to the canopy. Sports fans were treated to all sorts of excitement in England last weekend with the Tour de France starting in Yorkshire, an amazing Wimbledon men's final, and plenty of drama in the Grand Prix at Silverstone. The Silverstone race track is not far from us and the weekend starts with busy roads and a sky full of helicopters as people are flown in for the race. We always walk up to a local vantage point and watch the Red Arrows perform at the start of the race. They never disappoint! It was even better this year though as we were standing near a man who had a radio tuned into the frequency of the Red Arrows leader and it was just brilliant to hear him - he was obviously really enjoying the performance and whenever he turned upside down or went into a spin he laughed like a plastic bag! Super card - I do like the little booties! Perfectly clean and simple. 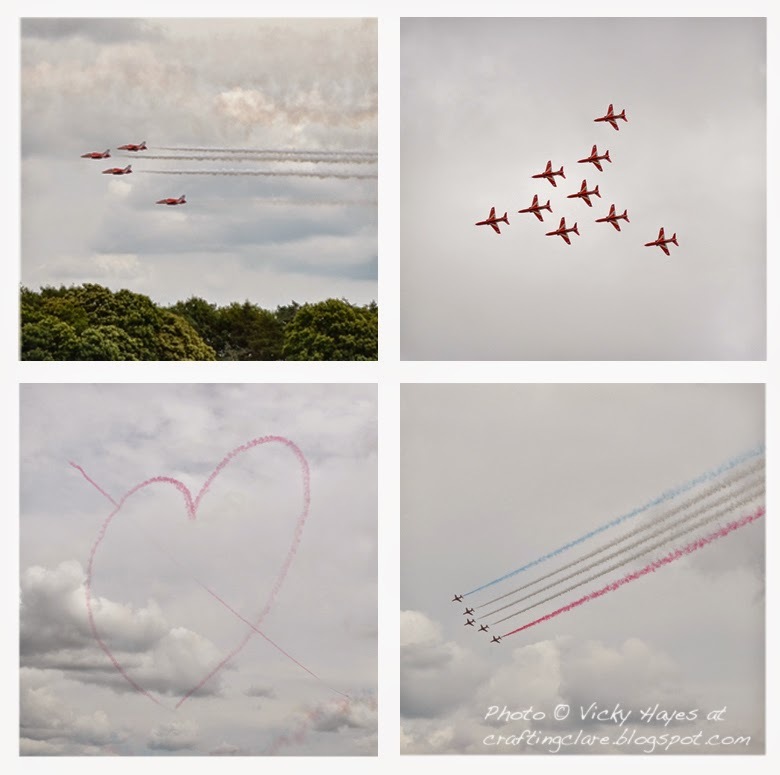 Love, love the photos of the Red Arrows - they have made me feel very home sick! We watched most of the Men's final - it was epic! Also love the piccies of the Red Arrows - and to hear one of the pilots - I'd want to be in there with him. I love airplanes. Hee hee hee . . . chuckling to myself at the Squadron Leader "laughing like a plastic bag"! You are priceless. Hasn't it been a wonderful weekend of sport? Would love to have been near you to experience it all with the Red Arrows AND commentary too!